Malicious hackers target all types of businesses. 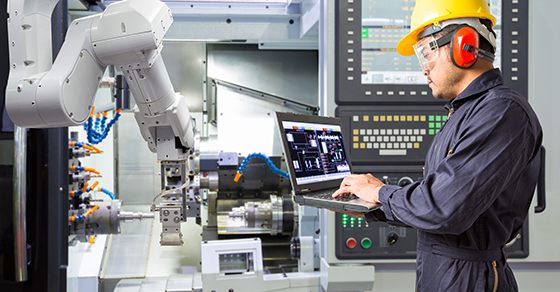 But manufacturers that rely on automation, robotics and connected networks are especially vulnerable to cyberattacks. Here’s what you can do to protect your manufacturing business. It’s only natural that manufacturers fear data breaches — and unfortunately hackers often can use that fear to cripple organizations through ransomware. This type of malware is installed on a computer or network without the user’s consent. Hackers demand that the company pay a ransom to regain control. Cyberattacks can harm a manufacturer or distributor by causing safety issues, negative publicity, lost productivity, and compromised personal and corporate data. The average cost of a data breach in the United States is approximately $3.6 million, according to the independent research group Ponemon Institute. Employees are a manufacturer’s first line of defense against hackers, but they can also be a liability if they’re not vigilant and knowledgeable about cyberthreats. Negligent employees are the No. 1 cause of data breaches in small and midsize businesses, according to Ponemon. So, it’s critical to provide training about the latest scams and encourage employees to report suspicious emails immediately to your IT department. Many hackers look for easy targets, so even the simplest security measure will deter some cyberbreaches. For example, you can use inexpensive, over-the-counter encryption software and phishing filters to make it harder for hackers to get inside your network. To minimize losses if a breach occurs, consider purchasing cyberinsurance products to cover direct losses from breaches and the costs of responding to them. Your traditional business liability policy probably doesn’t include such coverage. You can also assemble a breach response team before a breach occurs. Once it’s formed, the response team can also identify potential weaknesses in your network and conduct breach response drills. Contact us for more information about protecting your company from cyberattacks and other forms of fraud.